At the heart of Delhi is this colossal figure that stands tall and proud, one of the most distinguished addresses in the national capital, The Taj Mahal, New Delhi. Deriving the name from its location, Number 1 Mansingh road, the Taj Mansingh Hotel was the second hotel to be established by its owners, the Indian Hotel Company Limited (IHCL), after the inauguration of the Taj Mahal, Bombay on 16th December 1903. 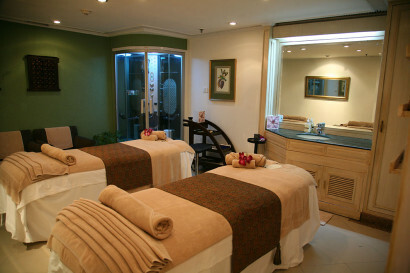 It is located in the exclusive residential area of Lutyens’ Delhi, close to the seat of government. 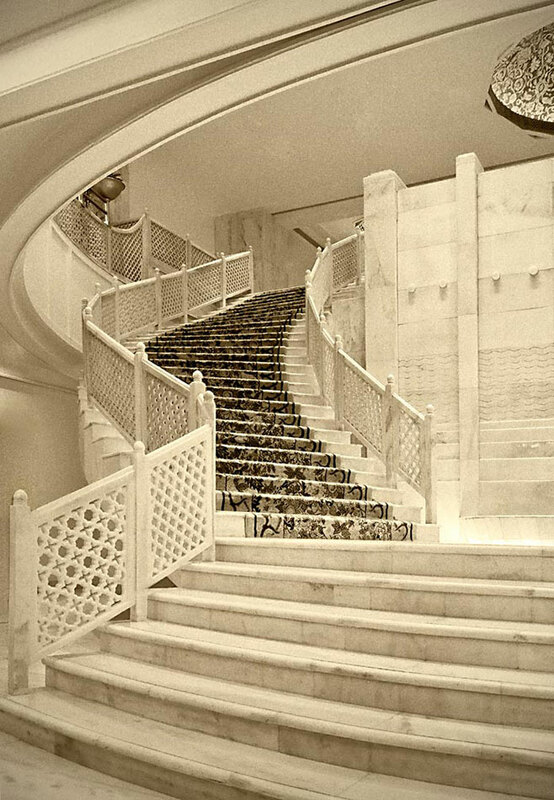 Reflecting the heritage of Mughal Delhi, this hotel offers a graceful architecture. The Taj Mansingh opened its doors to guests on 10th October 1978. Couturier Yves Saint Laurent launched the Taj Mahal Hotel to global audiences in 1979. However, only a few floors were operational at first. 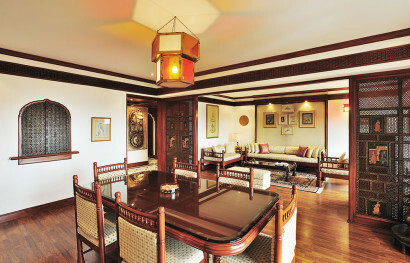 With passing years newer floors along with all the rooms and suites were made available to the guests. Located in the heart of Lutyens Delhi, proximity to key héritage sites is approximately 5-10 mins. Red Fort, Humayun’s Tomb, Lodi Garden, India Gate, Parliament House etc. are a few important héritage sites. 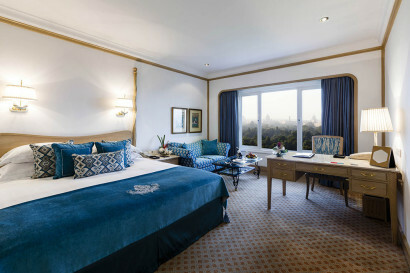 The Taj Mahal hotel is one of the most distinguished addresses in Delhi with all 292 rooms including unique thematic suites being “rooms with a view”. Its proximity to the seat of government, the city’s diplomatic corps and business district has furthered The Taj Mahal Hotel’s reputation as the epicenter of the Delhi. ‘Les Clef d’Or’ Concierge has also curated a few special Taj experiential tours – Rickshaw Tour, Lodi Wellness Walk, Humayun Tomb’s heritage walk and Change of Gaurd ceremony. The Hotel offers a customised ‘Rickshaw Ride’, in association with When In India Tours, to experience the multi-faceted charms of Old Delhi in specially designed Rickshaws for comfort and style. Lodi Garden Wellness Walk, the heritage walk at Lodi Garden is one of the most pleasant trails in Delhi. A world heritage site. Humayun’s tomb is a splendid example of Mughal architecture in India. It is often considered as the starting point of spectacular architectural projects of Mughals, which finds its culmination in the famous Taj Mahal in Agra. “Change of Guard” is a military tradition carried out by guards and sentries at palaces, forts and defence establishments. The 30 minute ceremony commences with the PBG troops, astride their caparisoned, sleekly muscled, powerful and well groomed steeds advancing from behind the Jaipur column to the tune of ‘Maa Tujhe Salaam’ played by the Army Brass Band. Chef Masaharu Morimoto, known to many as the Iron Chef, has garnered critical and popular acclaim for his seamless integration of Western and Japanese ingredients. Now Chef Yamamoto Masamitsu, one of the best trained chefs by legendary Chef Masaharu Morimoto, opens his kitch en to give a master class in the intricate art of rolling Sushi. The elegant Indian restaurant overlooking the hotel’s beautifully manicured gardens invites you to a cooking session with Chef Manoj Goel, where he will prepare a three course meal. We have a Terrace Garden, open area with beautiful terracotta benches along with a swimming pool and poolside lawns. Special in room children amenities available on request – toiletries, books movies and toys. A desert turndown with the child’s name on it is also done. The hotel offers The Taj Club, Executive Suites, Luxury Suites and the Grand Presidential Suite, as the pinnacle in high life of Lutyen’s Delhi. 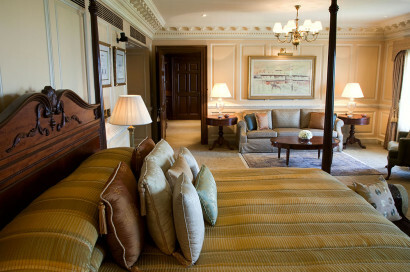 Every detail in this suite has been perfected to host Heads of State, CEO’s and celebrities from various walks of life. It is a tribute to hospitality and service, complimenting the broad boulevards and leafy splendor of Delhi’s chief architect, Sir Edwin Lutyens. • Deluxe Room, Measuring 357 square feet, these contemporary, recently refurbished rooms are well equipped with modern guest amenities. 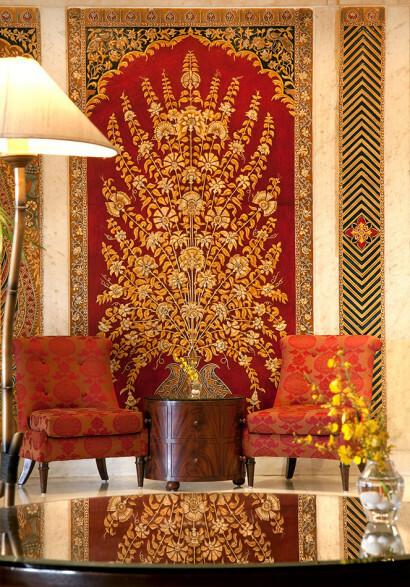 Classical decor and refined ambience make them an ideal choice for the discerning business traveler. • Luxury Room, The same amenities and views as the deluxe rooms, with the pleasing addition of a complimentary buffet breakfast. 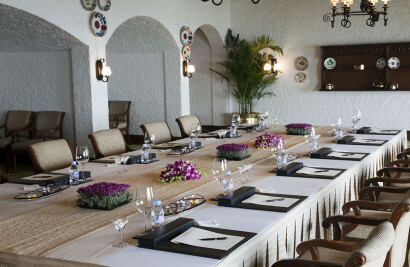 • Taj Club Room, a higher order of accommodation comes with a higher order of prerequisites. 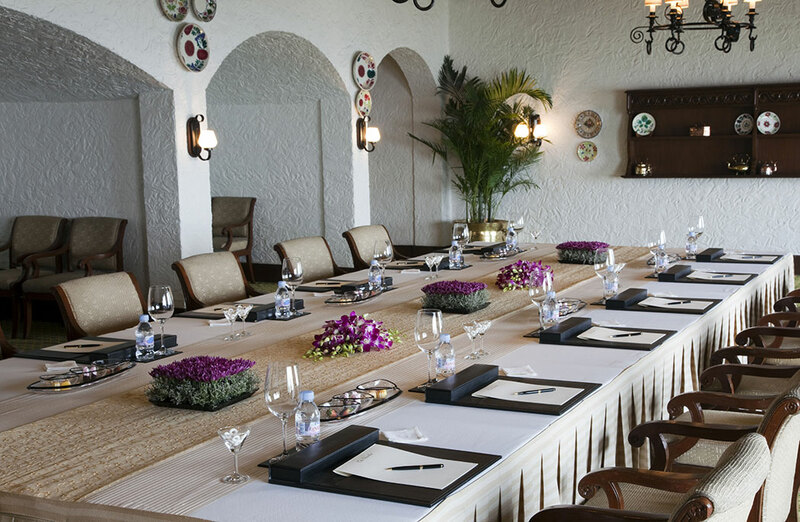 Our Taj Club guests are offered the highest level of personalized attention. From the services of a butler to the use of an in-room electronic safe, every convenience comes as a standard. Discerning travelers know that the Taj Club never disappoints. Club rooms offer stunning views, plush surroundings and a host of amenities, including fresh flowers, choice of newspapers and magazines. A combination of comfort, convenience, and executive level style, these suites measure 778 square feet and offer remarkable amenities. • Executive Balcony Suite, a combination of comfort, convenience, and executive level style, these suites measure 778 square feet and offer remarkable amenities. These rooms feature a bedroom, lounge/ living room with a workstation, walk-in closet and a large bathroom including bathtub and a separate shower cubicle. 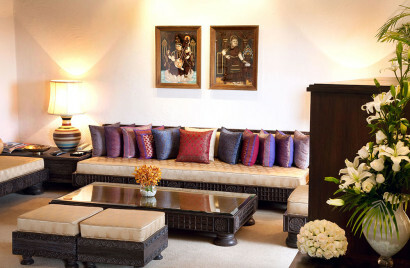 These suites have an enclosed balcony that overlooks the pool and lawns against a backdrop of Mughal Delhi. 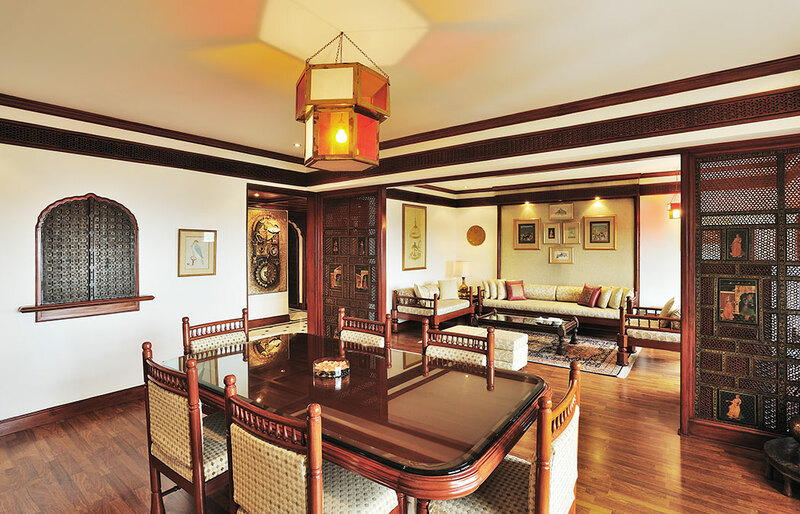 • Luxury Suites, these picturesque suites are named the Oriental and Tanjore and are themed accordingly. 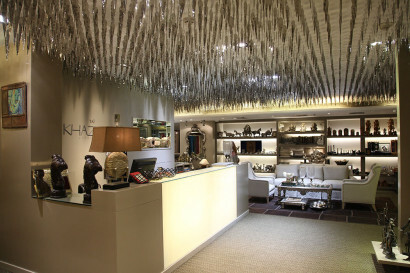 The artwork and antiques recreate old world charm with a blend of modern amenities and gracious personalized service. The suites offer fascinating vistas of the city – both the Presidential Palace view and the pool view. They have a spacious living room, bedroom, and dining room with a pantry. The privileges of the Taj Club are included. These suites, measuring 1031 square feet, have the option to be converted to a two bedroom suites, using an interconnecting room. 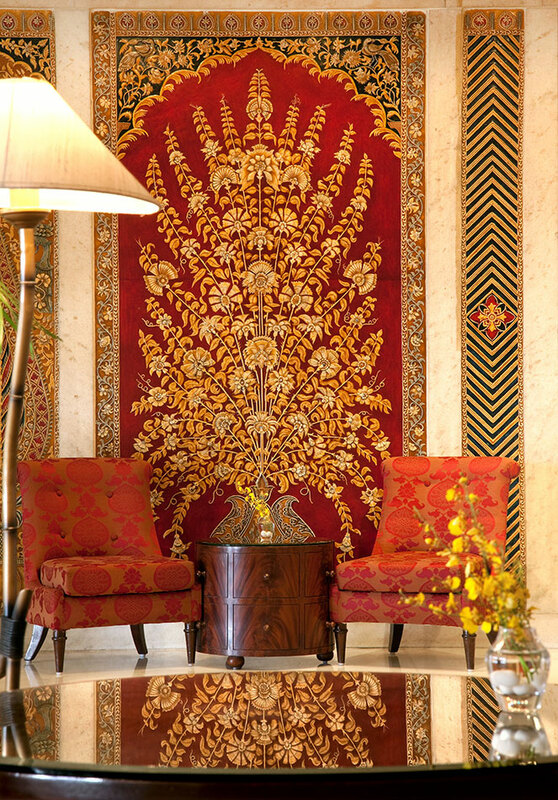 • Grand Presidential Suite, a tribute to the warrior kings of Rajasthan in North India – this suite has vibrant and earthy color tones. The artwork and antiques recreate old world charm and luxurious living of the Northern Rulers with a blend of modern amenities and gracious personalized service. The suite with approx. 1500 sq feet area, offers fascinating vistas of the city – both the Presidential palace view and the pool view. 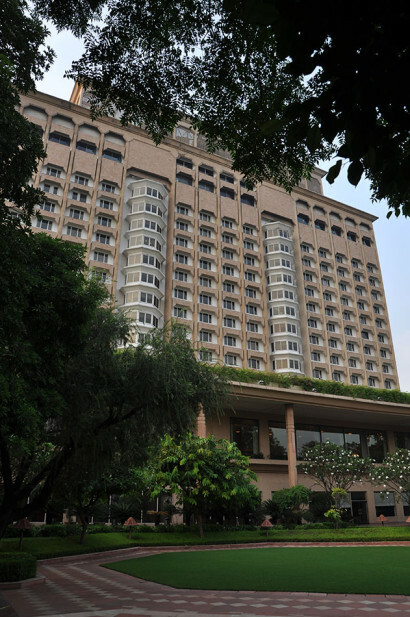 The Taj Mahal hotel, Delhi’s restaurants such as the evergreen Machan, The House of Ming and contemporary award winning signature dining at Varq and Wasabi by Morimoto are known as dining destinations of the Indian capital. • Machan – Our 24 hrs International eatery offering eclectic multi-cuisine options including the famous Sunday brunch. • Varq – Offers a Modern Indian Gourmet dining experience with authenticity of taste and artistic presentation created by Chef Hemant Oberoi. • Wasabi – A Japanese Restaurant Offering a delicious choice of sushi, Teppanyaki and sake. • House of Ming – A Chinese Restaurant with classic Cantonese and Sichuan cuisine at this legendary and ever popular restaurant. • Ricks – An award-winning lounge bar offering a wide selection of Martinis, wines, spirits and exceptionally creative Wok cuisine. • Elougne – An ideal meeting place with a wide variety of teas, coffees and desserts by day, and wines and cigars in the evening. THE SPA spreads across 5,940 square feet, features 2 single treatment rooms, 2 Couple rooms, and is a perfect abode to indulge in signature therapies by expert therapists. Revitalizing and restoring specialty treatments help unwind after a long day with various options at our health club and fitness center. • His Holiness Dalai Lama teachings.